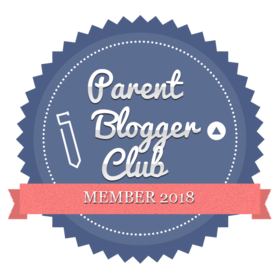 I’m always trying to find ways to keep Leo entertained and engaged so decided to sign up to Toucan Box and give it a go- he loves doing crafty things both at home and nursery. Toucan Box is a fortnightly craft subscription box aimed at children aged 3-8 years. Once ordered the box came very quickly and I loved the fact that it was personalised with his name – he absolutely loved this as he is always a little forlorn when he hasn’t received any ‘post’ like Mummy or Daddy. The outer box is brightly coloured and small enough to fit through your letterbox so there is no need to worry about being home for it’s delivery. Leo was VERY keen to open and start it immediately! Inside the box there is a personalised welcome note along with all of the items for your crafty session. 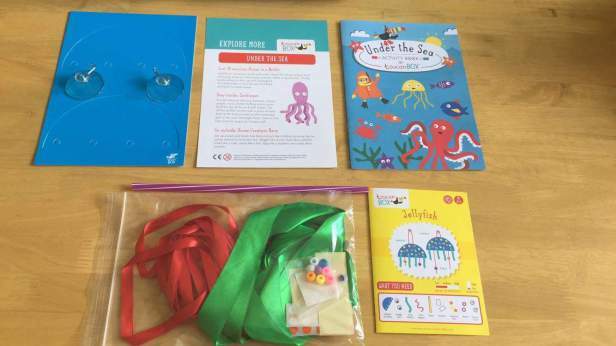 Our package contained items for us to make two hanging jellyfish, a sticker, an activity book, an information sheet and a directions booklet. The information sheet is fantastic as it gives tips and ideas for additional learning relating to the item you are making as well as giving ideas for other items to make again within the same theme. The directions booklet is extremely well designed and fool proof which is ideal for kids (and parents!). 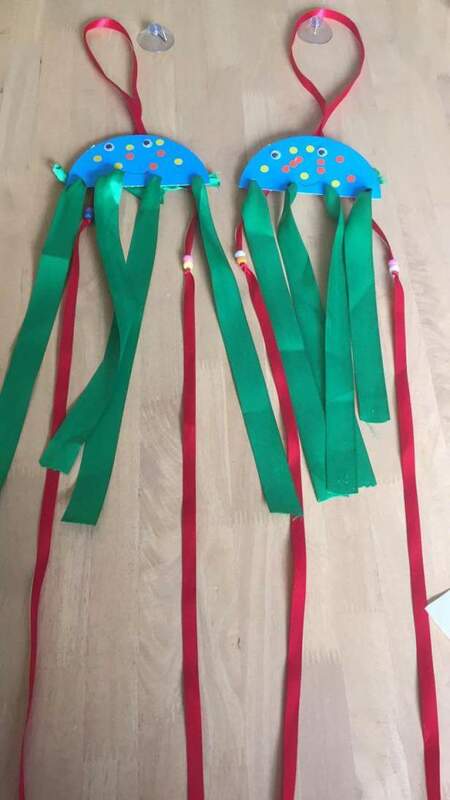 The only thing we needed for our jellyfish that wasn’t included was a pair of scissors as the ribbon and straw enclosed needed to be cut before use, but that wasn’t a problem. On the front of the directions booklet the activity is given a rating based on grown up assistance and messiness and I was relieved to discover ours was rated low on mess! On the reverse of the booklet it gives three facts about Jellyfish, again this adds a little something extra in terms of knowledge and education. Making the jellyfish took us around half an hour, Leo loved every second and he was extremely proud of his finished items whom he has named Jilly and John! Once complete you use the suckers provided to hang them up to display and they are proudly displayed in our window as I write this. I found all of the items for the make to be very good quality – especially the hanging suckers as quite often these kinds of things don’t stick well and are prone to falling off however the ones included have stuck fast even with a little pulling by Leo. I would definitely recommend Toucan Box as I found it ideal having everything you need in one box and to be able to just sit down and instantly ready to start – ideal for impatient kids! The boxes are ideal for the colder months where you are stuck indoors and the weather is grim. Boxes cost £5.95 fortnightly and your first box is completely free so it’s well worth trying it out. There is no commitment to keep buying and your subscription can be paused at cancelled at any time. I know he was thrilled ! It’s always the toy that draws them in isn’t it ! Magazines are so expensive too aren’t they ! 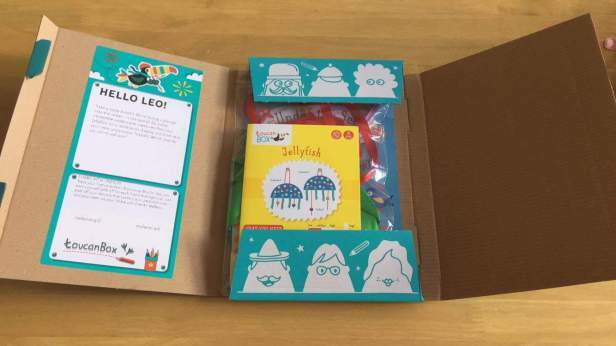 This looks fantastic for kids & I love that Leo likes getting post now to. Excellent to get kids to be more creative and looks really engaging. Great review.